Click here to view a PDF copy of the letter. The letter from attorney Trenton R. Garmon also charged that, "Your client [Alabama Media Group] as an outlet carelessly and perhaps maliciously reporting that my client, Judge Roy S. Moore, noted and signed a Yearbook of an accuser as a "DA" and in a manner which experts, to include our own, have confirmed is not consistent with his handwriting (To wit: structure, strokes, slant, base alignment, etc.) and does not comport to his typical vernacular." 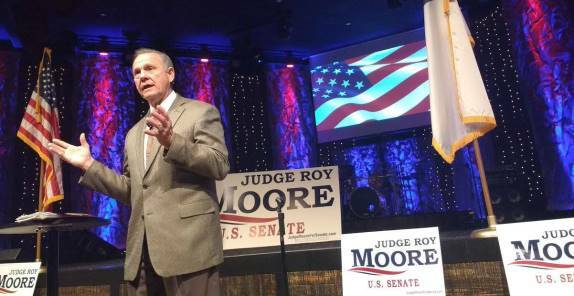 The letter also rebutted in the strongest terms other accusations against Judge Moore, saying, “"Your client [Alabama Media Group] as an entity has also carelessly and perhaps allowed general slander and libel to the reputation of my client [Judge Roy Moore] by seeking out, and/or reporting from those who did, individuals who falsely portray the reputation of Roy S. Moore in northeast Alabama, to include Etowah County. This careless and/or malicious reporting includes reports that Judge Moore was "banned" from the Gadsden Mall, was on a watch list for the Gadsden Mall, had a general reputation of "predatory behavior", that he badgered teens and had a general bad reputation. Such is untrue and is due to be recanted." The letter from Mr. Garmon also demanded that Alabama Media Group protect and preserve documents and other evidence in the potential lawsuit, noting, “… our request includes all tangible and digital evidence such as, yet not limited to, handwritten notes, yearbook(s), journalist pads, spiral reporter pocket pads, text messages, sms messages, instant messages and any other tangible or digital evidence." The letter closed with a demand for a “full and fair public retraction” saying, "Also be aware that we believe the publication(s) and report(s) made by your client's organization were made with knowledge that the matter published are false, or they were published with reckless disregard of whether it was false or not. We are providing five  days for a full and fair public retraction in as prominent and public a place or manner as the matter published." Judge Moore's attorneys sent the letter to the Alabama Media Group before lawyer Gloria Allread's bombshell appearance on CNN when she refused to deny that the yearbook signature is a forgery. Based on Representative Jackie Speier’s testimony and appearance on MSNBC, it looks like $15 million of taxpayer hush money was paid by McConnell and Ryan to accusers of Members of Congress for sexual "harassment." Rather than demand a public trial and airing of the charges, as Judge Moore has done, McConnell and Ryan paid millions of dollars in taxpayer funded hush money to protect sitting members of Congress from these same kinds of charges. It seems to us that, based on the new “seriousness of the charge” standard they have created and applied to Judge Moore, all accused sitting and current congressman should be asked to resign. Even if you reject Roy Moore's protestations of innocence, the principle applies. Why should there be a different standard for sitting Members of Congress than candidates? If Mitch McConnell, Paul Ryan and Cory Gardner think Moore doesn't have the character to serve in the Senate based accusations he says are false, and is willing to litigate, then surely a member who has paid hush money for an accuser to go away should also be forced to resign. Roy Moore is ready to fight the charges against him in a public court of law; before he can be forced off the ballot we demand McConnell and Ryan reveal the names of Members of Congress on whose behalf millions of dollars in taxpayer funded hush money was paid. Submitted by MikeyParks on Thu, 11/16/2017 - 18:25. It looks like the worm is beginning to turn. That yearbook is going to blow this case out of the water. McConnell, do you want your crow with or without feathers? Hope you and your fellow a-holes are hungry! Submitted by Jjb54 on Thu, 11/16/2017 - 13:45. Well, this is where it should have went on day 1, 2/b honest. Now we see who is "bluffing" and who is not. This whole thing and ALL those "Ladies" accusations will "go down in flames and be nothing but ashes to be blown away by a puff of air."